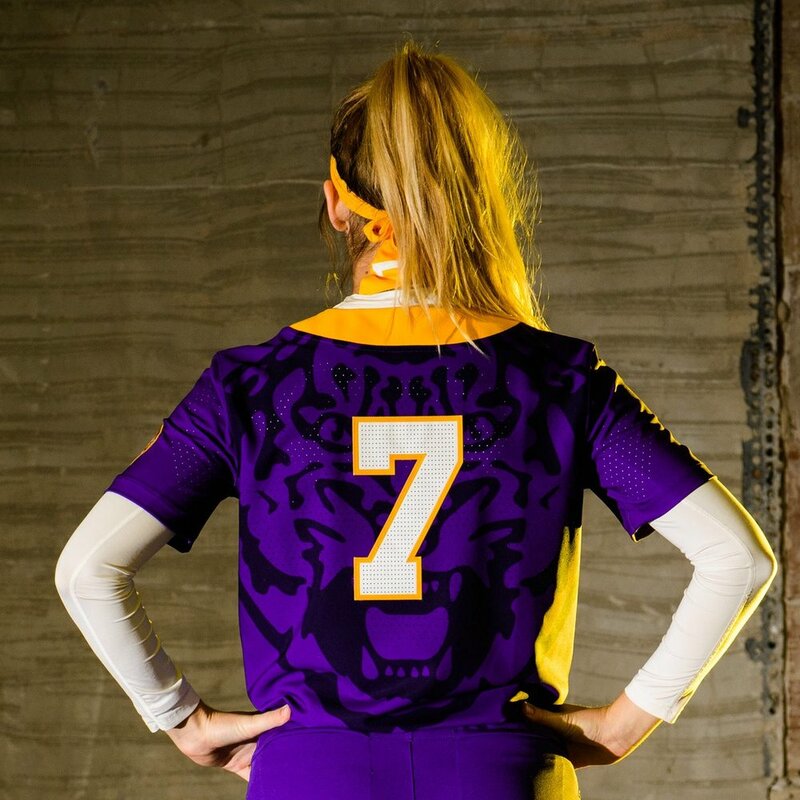 The University of Pittsburgh softball team unveiled their retro uniform for the 2019 season. We will see the Panthers wear their retro unis for every home Sunday game this season. 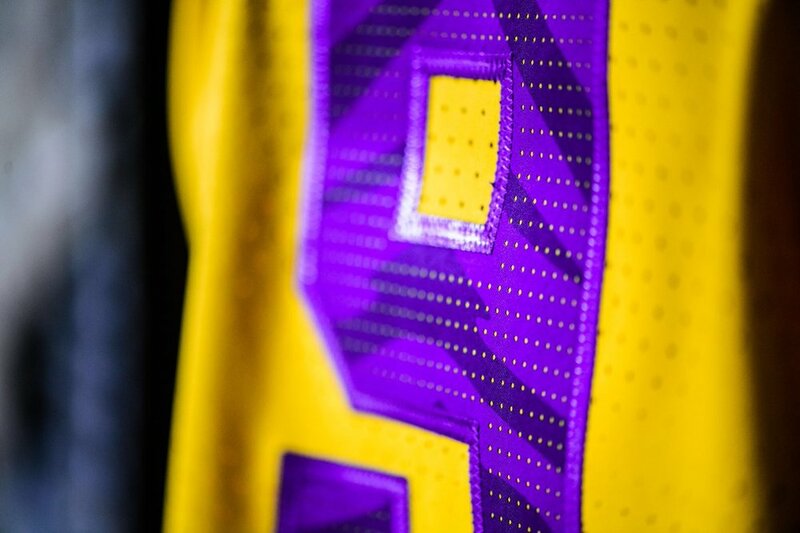 Like the baskeball retro unis. 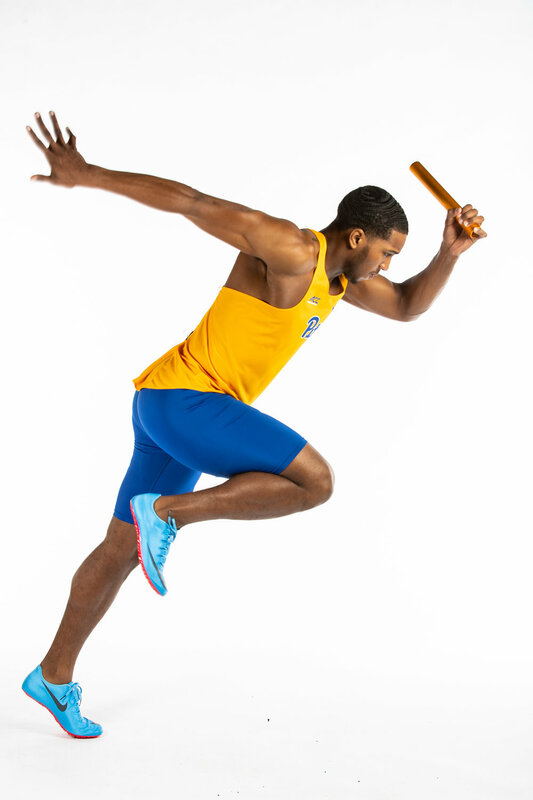 SEE HERE The OLD SCHOOL BLUE AND YELLOW DOMINATE THE UNIFORM AS THE JERSEYS are A BLUE BASE AND YELLOW LETTERS AND NUMBERS. 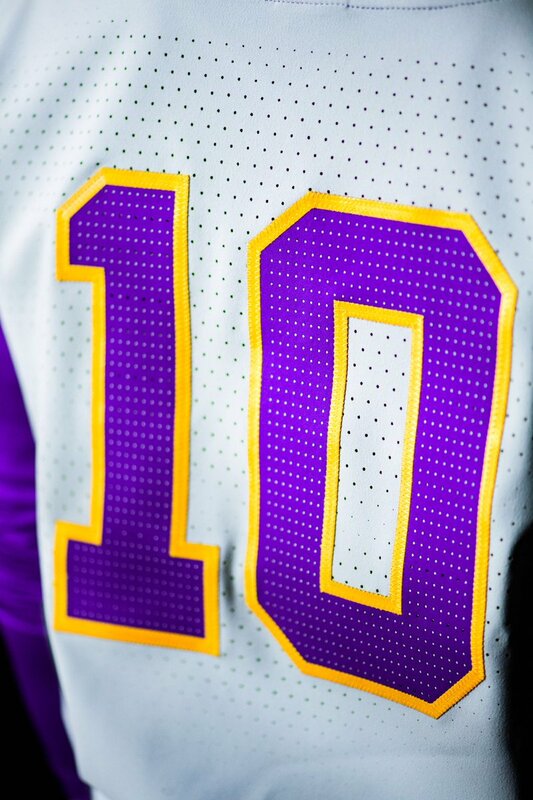 TO FINISH OFF THE LOOK THE PANTHERS WILL WEAR WHITE PANTS THAT HAVE A SMALL PINSTRIPE DOWN THE SIDES. 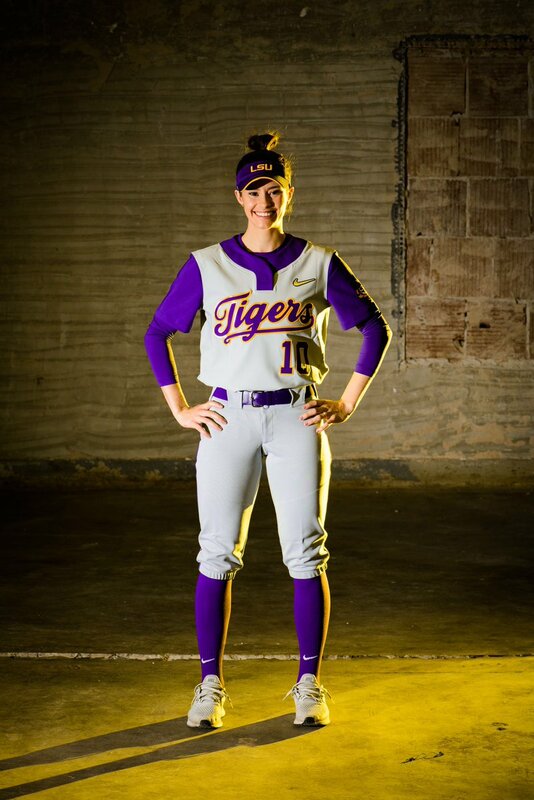 LSU Softball has revealed their 2019 teal ‘Strikeout Ovarian Cancer’ uniforms. 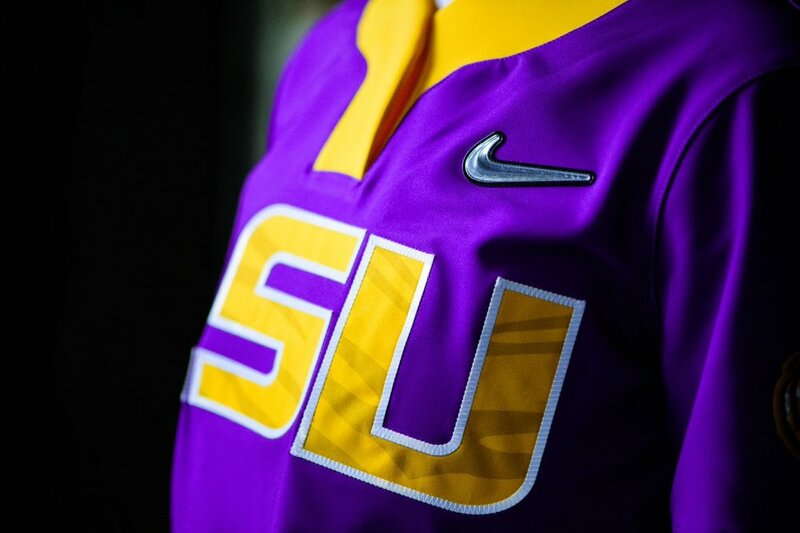 The Tigers will sport a teal jersey that features LSU across the chest in white outlined in purple. The team will wear white pants with the teal jerseys and have a special batting helmet. On the sides of the helmet will be the ovarian cancer ribbon. 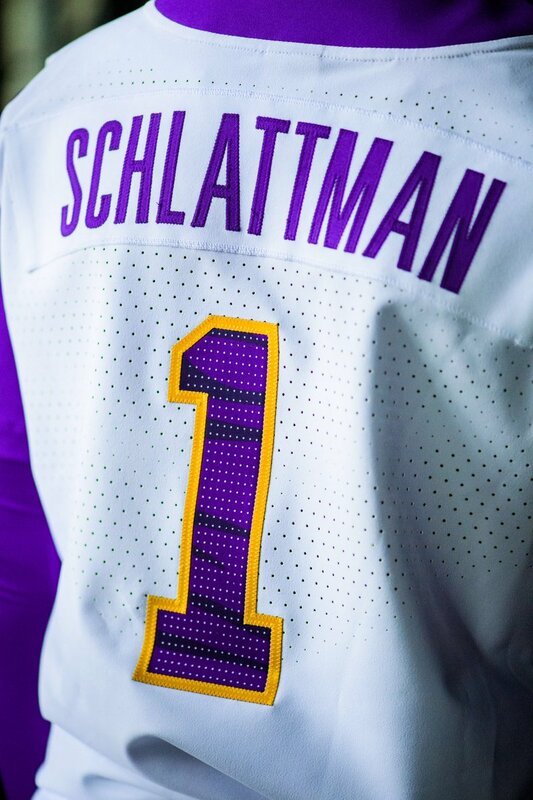 THE BILL OF THE HELMET HAS A TIGER STRIPE PATTERN IN THE SAME TEAL, PURPLE AND WHITE COLORS. THE REALLY SPECIAL PART OF THE DESIGN IS THE RIBBON ON THE SIDES THAT HAVE THE NAMES OF WOMEN WHO HAVE COURAGEOUSLY BATTLED OVARIAN CANCER. 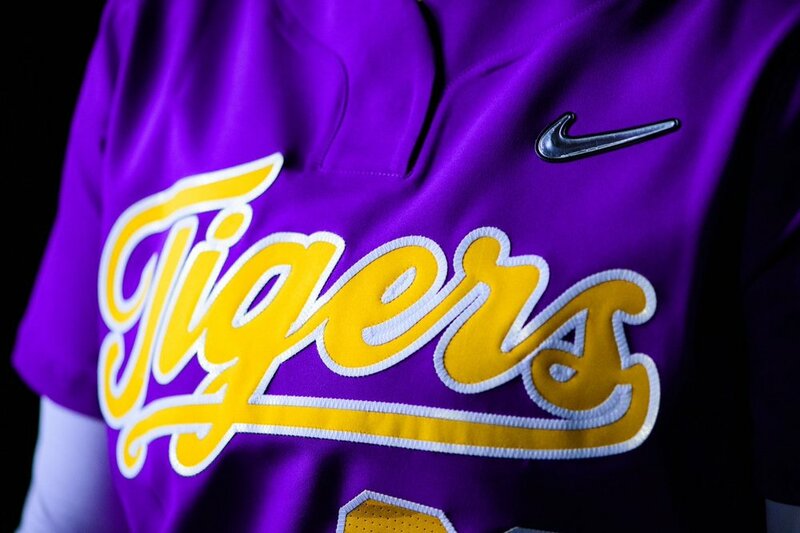 We will see the Tigers debut the uniforms against Mississippi State. 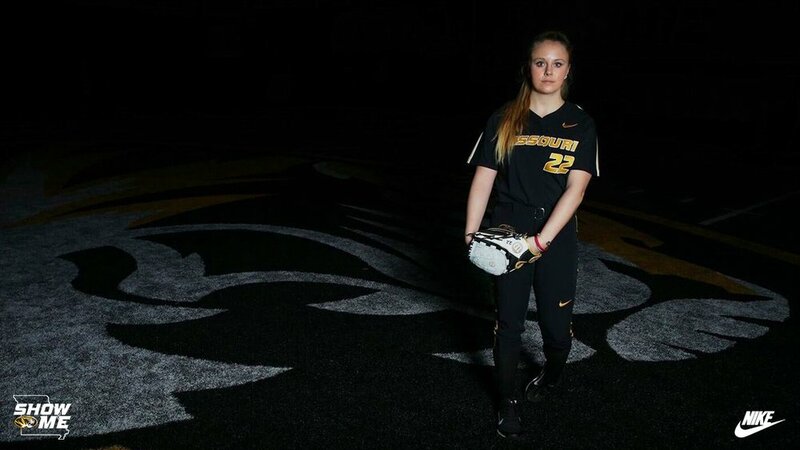 Georgia Tech Softball has introduced their new adidas softball uniforms for the 2019 season. 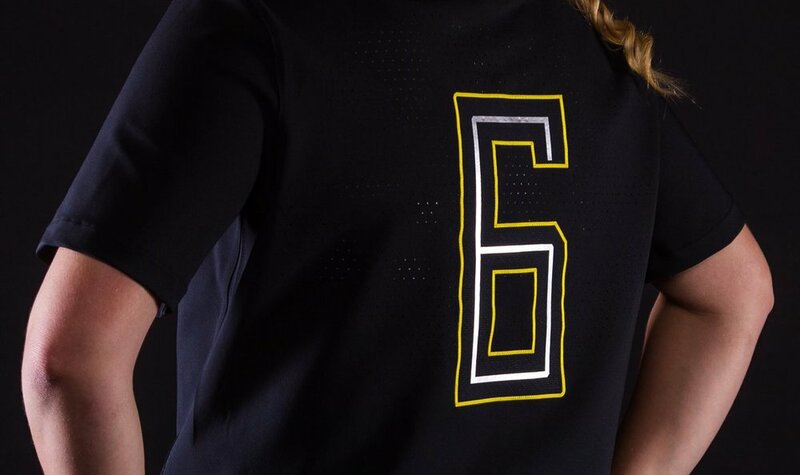 As part of the softball and baseball uniform design, Georgia Tech Athletics and adidas introduce two classic script logos that lean on the tradition of the two sports combined with Georgia Tech’s brand. 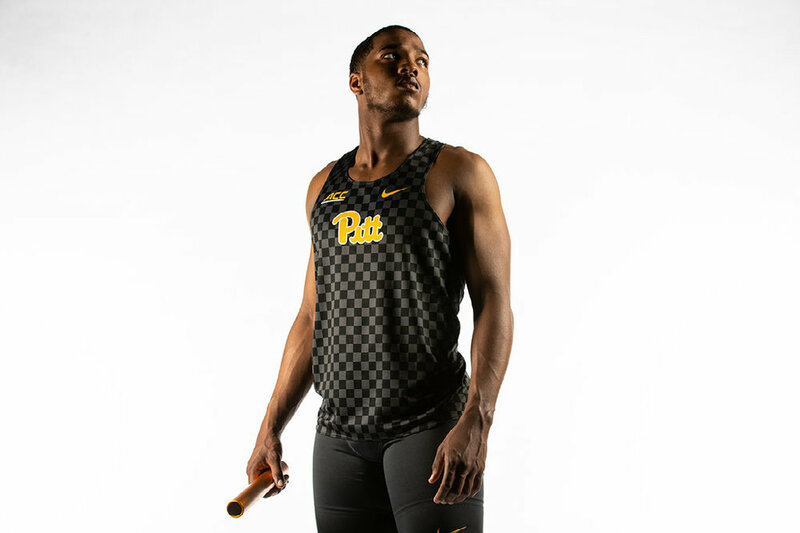 The team will have the option of a gold top that features the new Jackets script across the chest, a white top with navy sleeves and navy Tech script on the chest, the traditional whites with the GT logo, and a navy top with the Jackets new script logo. 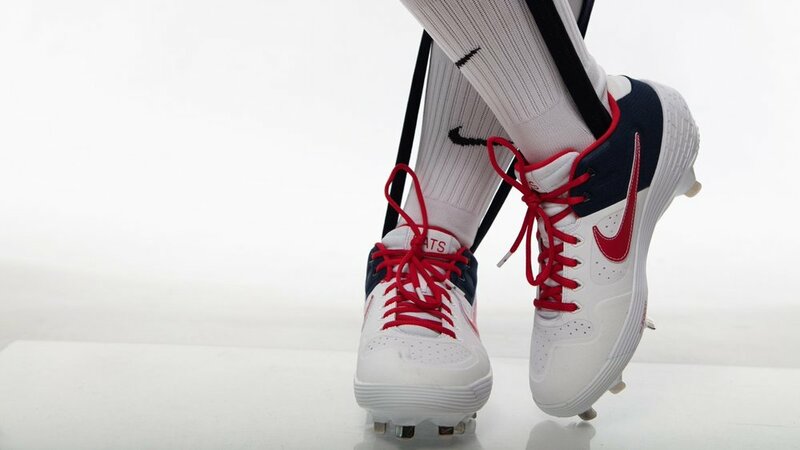 This gives the Georgia Tech softball team multiple options to mix and match throughout the season brings the new brand to the softball field. 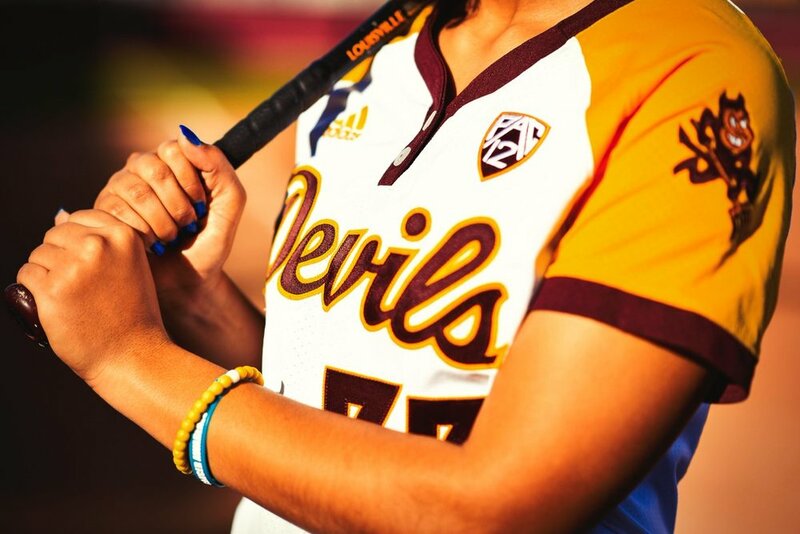 The Sun Devils have revealed their 2019 Softball uniforms. 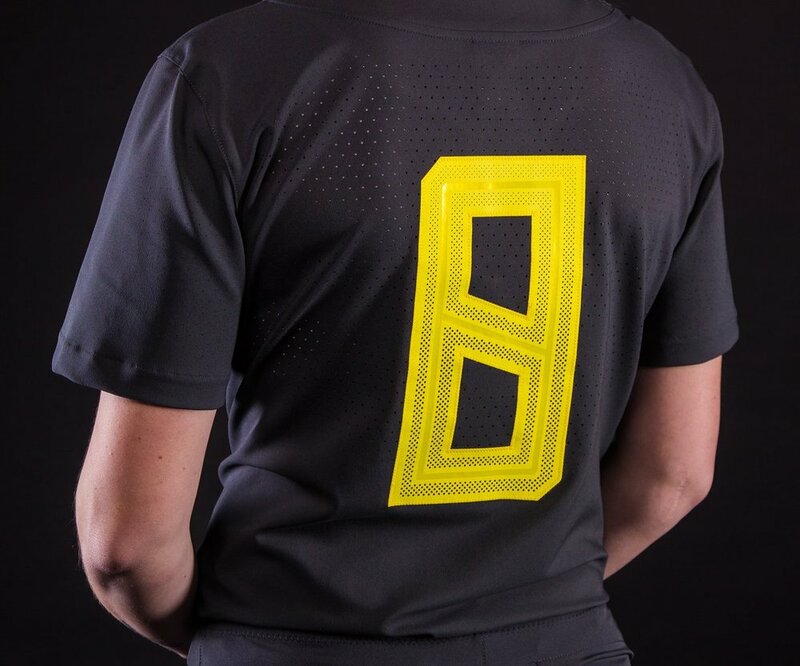 The team will have over seven different options to choose from and mix and match this season. Along with the traditional maroon and gold uniforms we see the team introduce a camo salute to service uni and a blackout uniform. 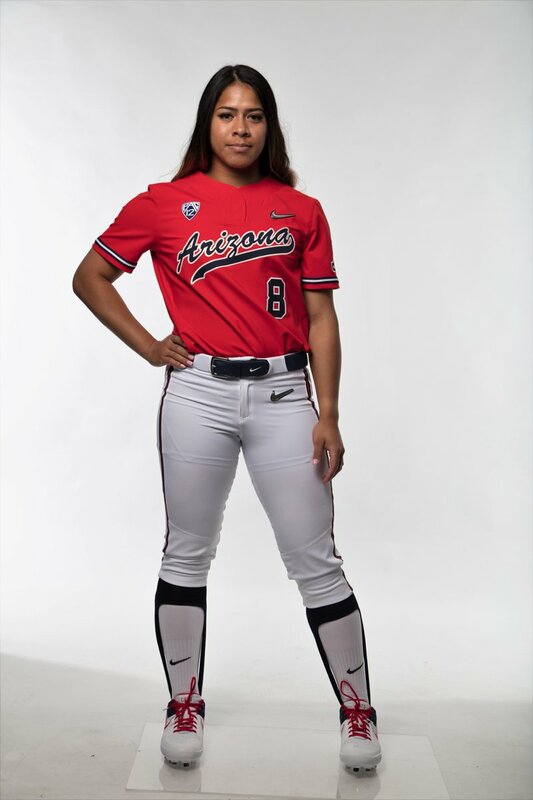 Each jersey alternates from having ASU, Sun Devils or Arizona State across the chest. 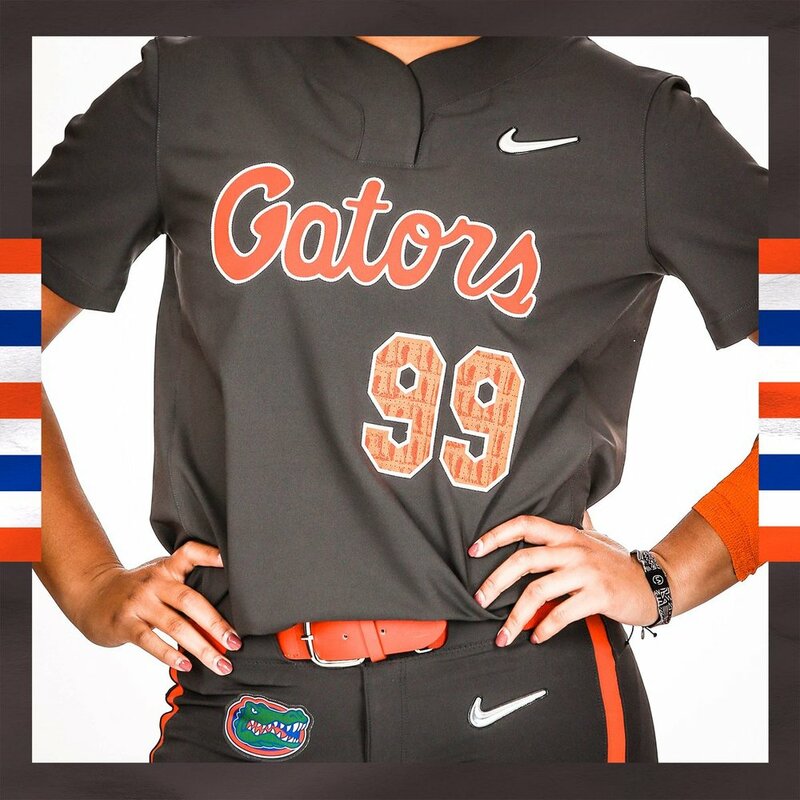 The Florida Gators Softball team joins the elite nike programs in receiving the new Nike Vapor Prime 2.0 uniforms. 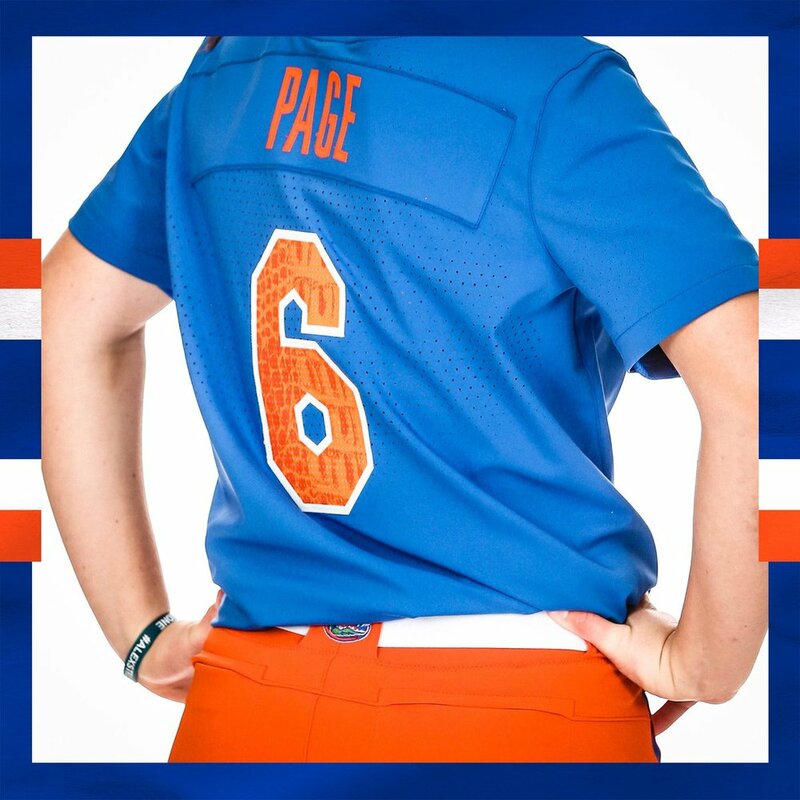 The Gators will have five different jerseys and pants that they can mix and match throughout the season. 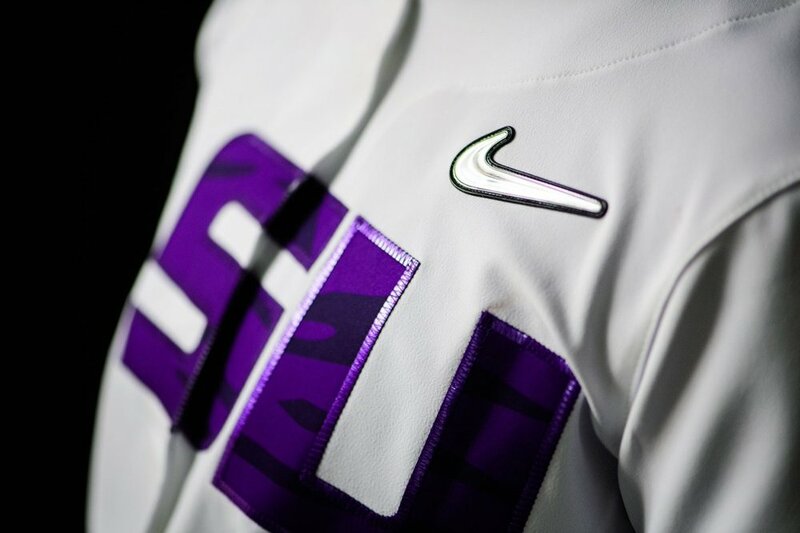 The team will have their traditional white, blue and orange colors that will feature block letter to script gators. 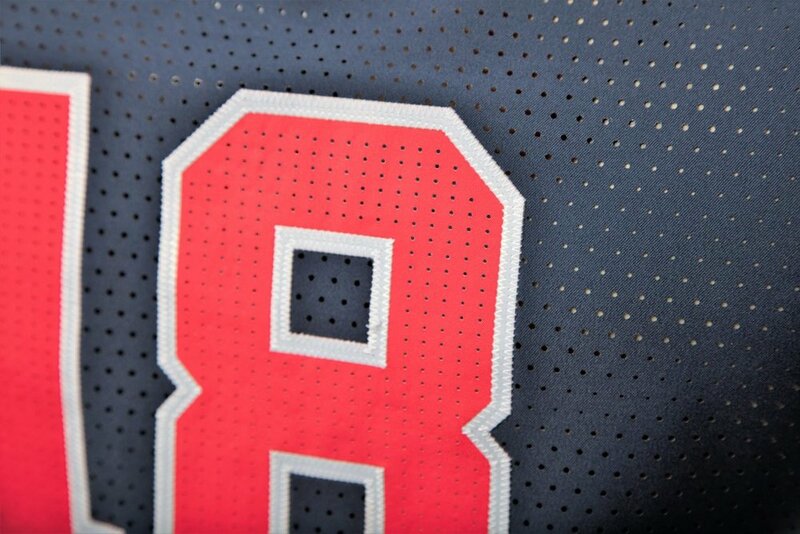 The detail in some of the uniforms show off an alligator skin texture seen within the letters and numbers. 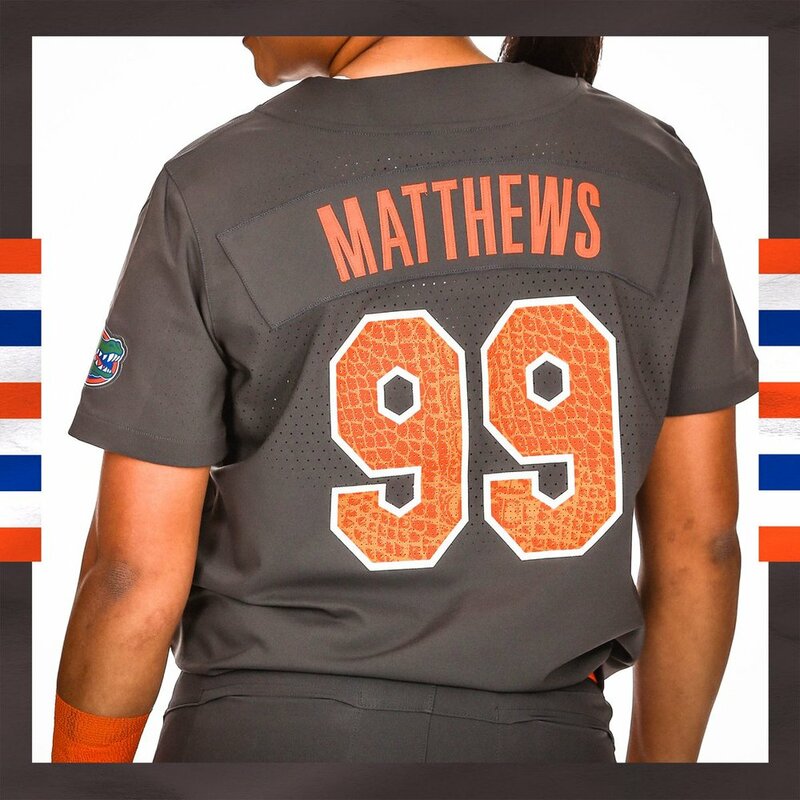 The team has added an anthracite alternate look that will feature orange letters and numbers with the numbers showing off the alligator skin texture. 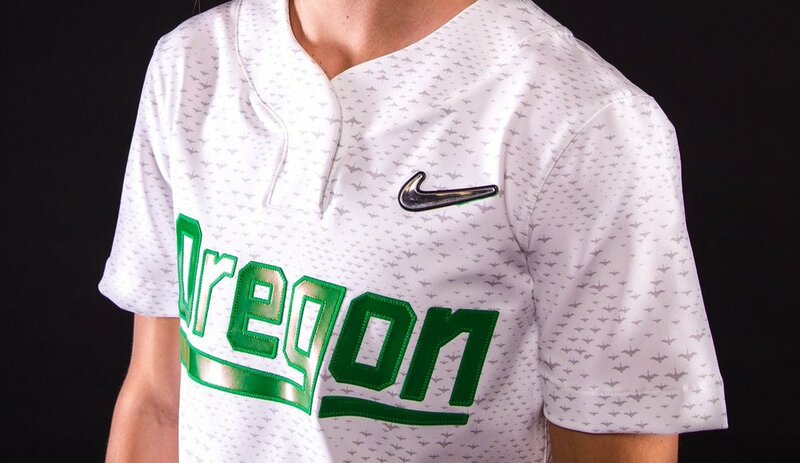 Oregon’s Baseball and Softball have revealed their new uniform lineup for this season. 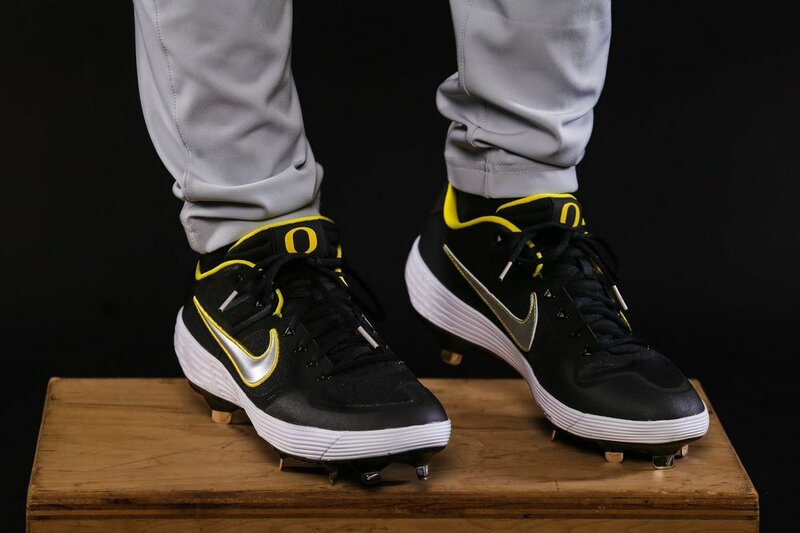 The ducks will rock Nike’s new Vapor Prime 2.0 uniforms when they hit the diamond. 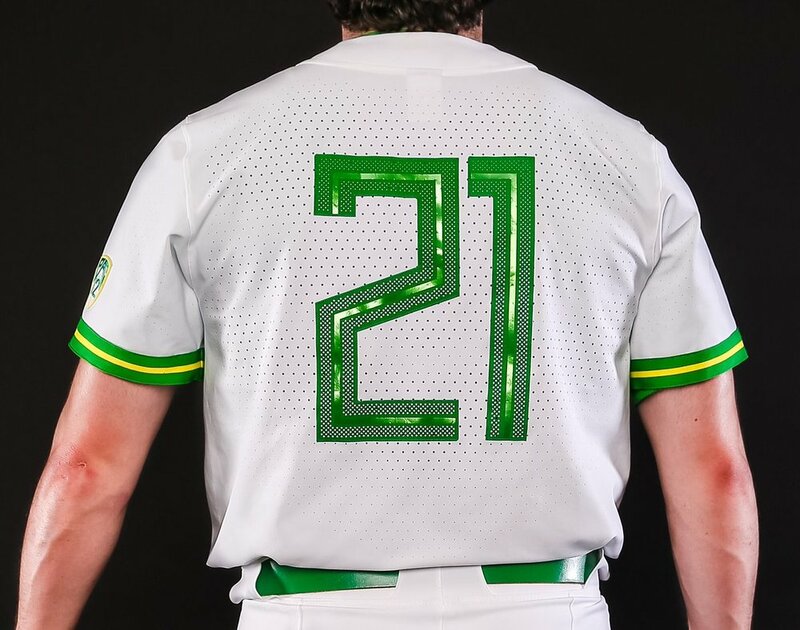 The will have plenty of options to choose from with their green and yellow colorway but will also have some alternate looks in grey and black. 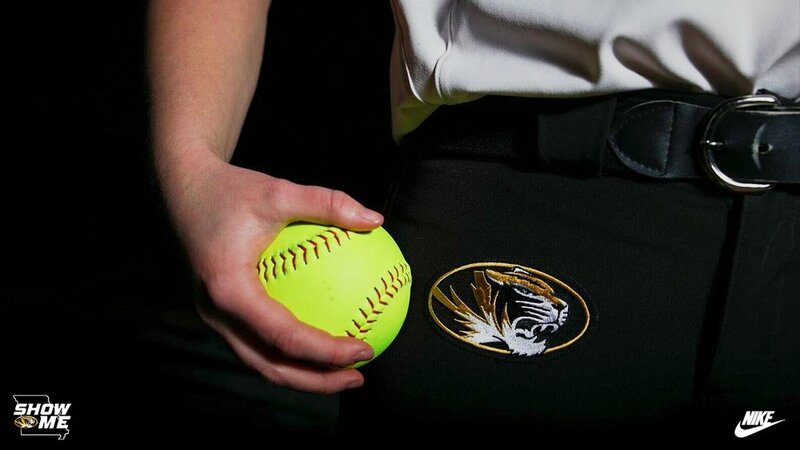 Missouri Softball has released their five uniform combinations that they will rock this season. 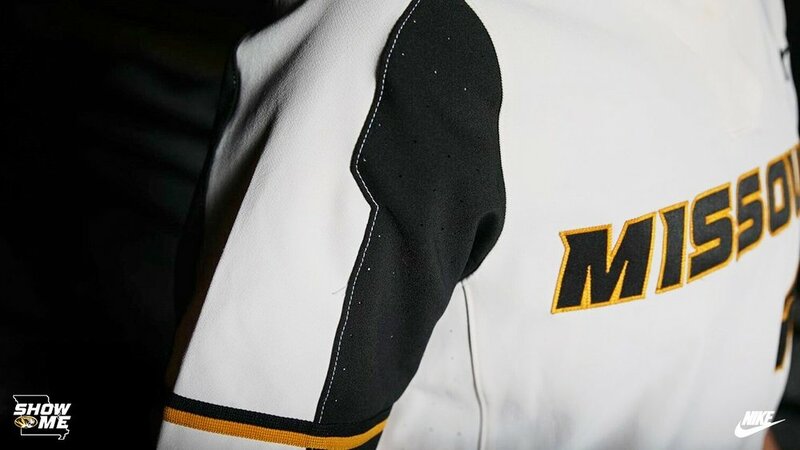 The Tigers will have gold jerseys with Tigers across the chest that will be paired with black pants, an all anthracite look that features MIZZOU across the chest, traditional white jersey with black sleeves paired with black pants, the all black uniform with gold lettering and piping, and finally the icy all white look. Honor the Past. Embrace the Future. 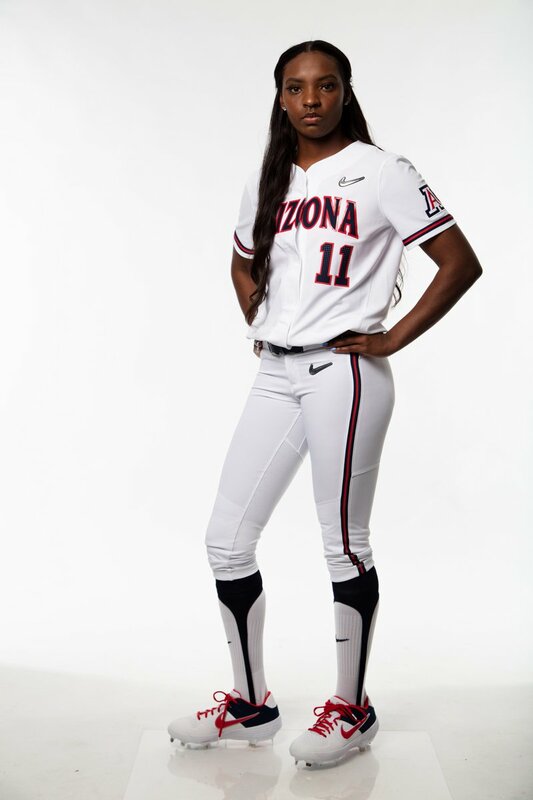 The Arizona Wildcats softball team has released their new line of uniforms for the 2019 season. The is one of the select schools to receive Nike’s new Vapor Hyper Elite 2.0 uniforms. 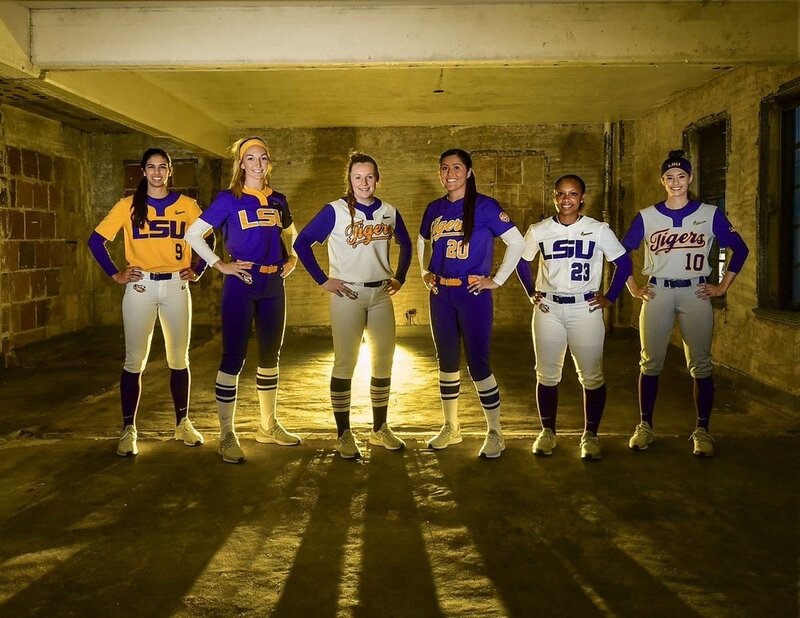 The team has 6 different uniforms that they can mix and match throughout the season. 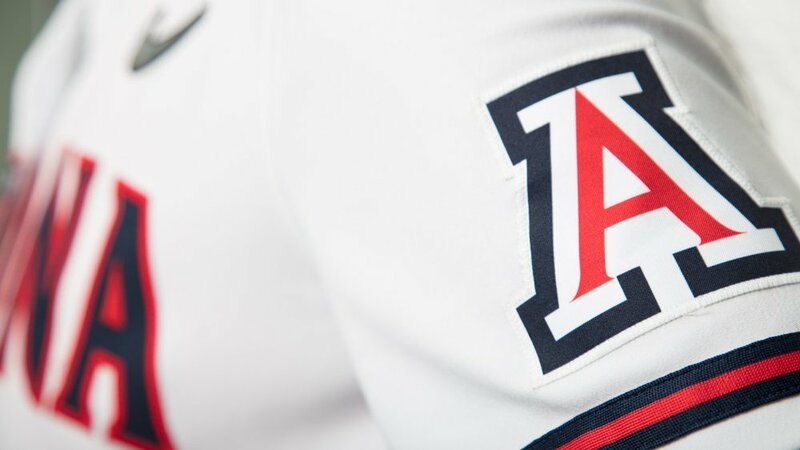 The options are; the traditional block white uniform, alternate light grey with the Arizona script, the charcoal grey with the red block Arizona, the script white uniform, a red jersey with the script Arizona on the chest, and finally a full navy look. 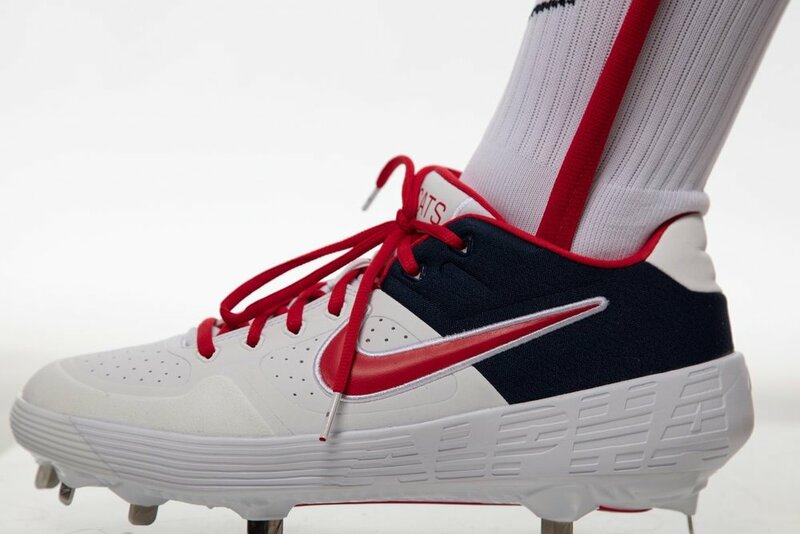 The team will also have custom team edition cleats that they will rock with all their different combos.